Jim got a little Han Solo in carbonite ice cube/chocolate mould for Christmas. 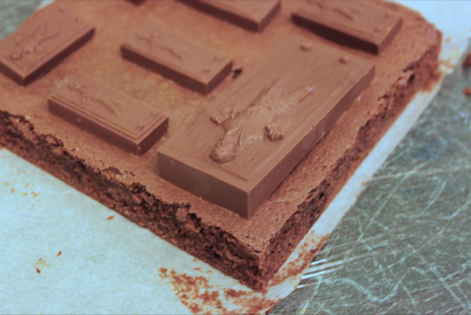 So I thought I&apos;d put it to use and make him some brownies and using the chocolate bars as insets. 2, Beat the sugar into the melted butter and chocolate. Leave this to cool. 4, Beat the eggs into the cooled chocolate/butter/sugar mixture and then sift in the flour, baking powder and cocoa. Fold to combine. 5, Pour into the cake tin and bake for 20 minutes until cooked through and the top is slightly springy. This needs to be quite a firm brownine or it will fall apart when cutting. Cool through and then refridegrate for at least 30 minutes to make it. 6, Using a small paint brush, stipple a thin layer of chocolate over the mould base paying particular interest to the face, hands, feet and body cavities. Fill the chocolate moulds with the rest of the chocolate (reserve a little for later) and chill until solid. 20 minutes in the freezer will be fine. 7, Unpop the chocolates from the moulds. I was surpised how realistic they were and how easily they came away from the moulds. 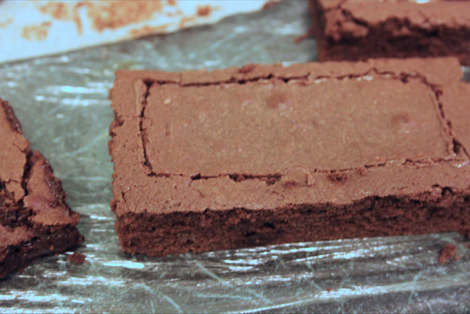 8, Trim the edges off your brownies and lay the chocolates over the brownie surface and cut around them. 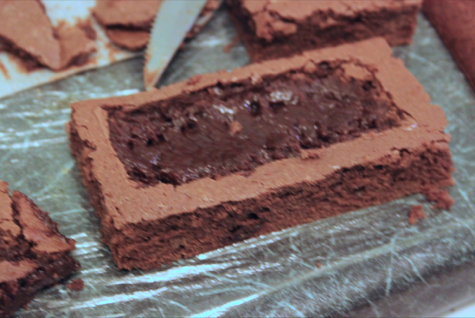 You want to leave a gap of about 1/2cm around each of the chocolates. 9, Score closely to each of the chocolates into the top of the brownies and carve out a little hollow to sink the chocolate into. 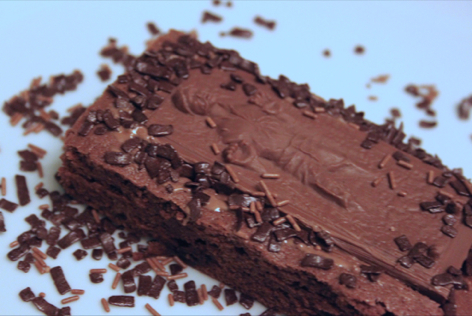 Spread a little melted chocolate into each cavity and press the chocolate Han Solo into it. Now that is what I call dedication Hannah. It looks really effective though, so worth the extra effort. Thanks Choclette, definitely worth the extra effort - mainly for the huge chunk of chocolate in a chocolaty brownie! A great fun cake and some serious chocolate. I'm sure I've seen the film but I can't remember anything about it other than it had Carrie Fisher and some robots. Thank you Phil. 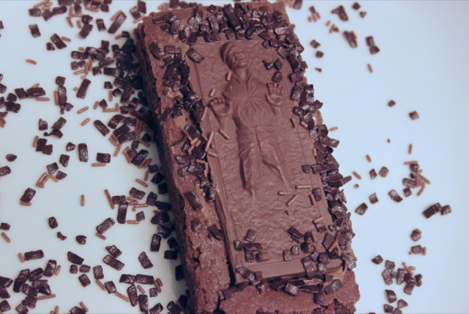 I think I prefer a chocolate Han Solo to the original! Thank you very much for your kind words Mary. Your blog is lovely, I especially like the idea of your brown butter and bourbon pound cake! Funny brownies. That is a great idea. 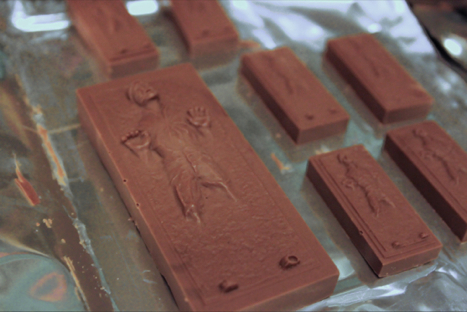 Too bad, I don't have a Han Solo in carbonite chocolate mould.